Set in the heart of the Strathearn Valley, this beautifully appointed holiday house is a perfect base from which to explore the magnificence of the Perthshire countryside. There is so much to do in the area - from outdoor pursuits to spa treatments, opportunities abound. This part of Perthshire has everything you would expect and there are wonderful activities available throughout the year. In the immediate area there are opportunities for salmon fishing on the River Earn (and elsewhere nearby), parachuting, field sports, and the world famous golf courses at Gleneagles which are a short drive away. Also on offer at Gleneagles are a myriad of other activities, such as clay pigeon shooting, equestrian facilities, and spa treatments - not to mention the exceptional dining experiences. Within a short distance there are many attractions such as the Innerpeffray Library; local distilleries such as Glenturret, the oldest in Scotland; Drummond Castle and its famous gardens. The cities of Perth, Stirling, Dundee, and Dunblane with their abundance of castles, monuments, science and cultural attractions are all within very easy reach too. Further afield, the diversity will astound even the most experienced travellers - the majesty of Glen Artney Deer Forest in October as the Red Deer go through their rut, to water sports on Loch Earn, through to the breath-taking scenery which is enjoyed by hill walkers, cyclists and casual day trippers alike. 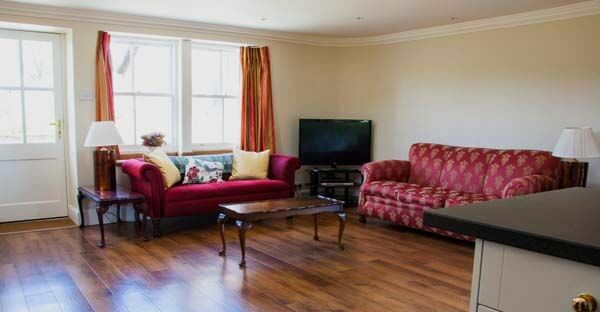 Though it's within an hour's drive from Edinburgh and Glasgow, and easily accessible by train from Gleneagles Station, the house is a haven of calm and relaxation. 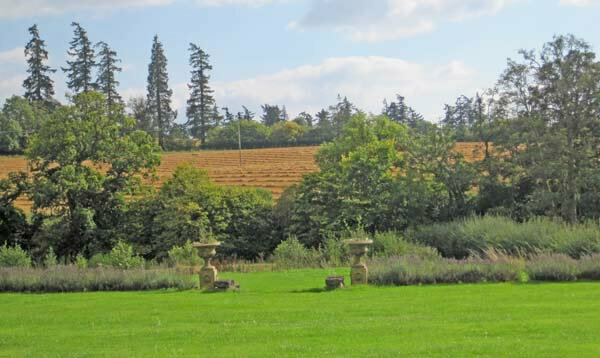 This is an idyllic place to stay in Perthshire and perfectly situated to visit much of Scotland. Golf - Perthshire has 30 golf courses including Gleneagles 6 miles away. Walking or cycling from the front door to as far as you wish to go! Set over two floors, the West Wing is part of an old refurbished mill situated in 17 acres of farmland in the heart of Scotland. The owners live on site and are available to offer assistance and/or information. 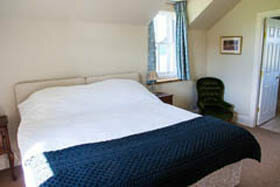 Upstairs there are three double/twin bedrooms, all ensuite with zip and link beds. 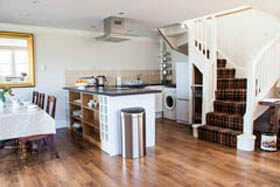 Downstairs is one large open plan dining/sitting room and kitchen, with a door leading to a patio and garden. 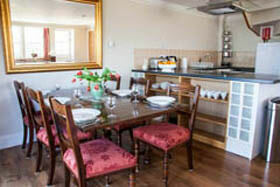 The kitchen is equipped to a high standard with microwave, hob/oven, fridge/freezer, dishwasher and washing machine. The whole building has been finished to the highest specification and offers light, airy accommodation. The West Wing has its own access and parking for several cars. From Stirling on the A9 take the A823 to Crieff, pass Gleneagles Hotel and turn right at the mini roundabout. At the next mini roundabout turn left and follow the road into Tullibardine. Take the left turn signposted Muthill and Strathallan Airfield. After approximately 1 1/2 miles, after crossing a narrow bridge on a corner, take the right turn to Strathallan Airfield and Kinkell Bridge. Approximately 1/2 a mile on the right you will see the sign for Milton of Machany, head up this drive, take the left hand fork and park to the left of the beech hedge at the top of the drive. Complimentary welcome pack and cleaning materials. Local free range eggs on request. The West Wing is rented out throughout the year. Change over day is usually Saturday. Arrive after 4pm, depart by 10am. 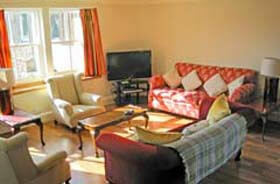 To book this delightful holiday house near Gleneagles, click the enquiry button below and see availability and prices. This superb Perthshire holiday cottage is in a great location if you want a Scottish golfing holiday - just 6 miles from Gleneagles and within easy distance of many other excellent golf courses, including St Andrews. Of course there's lots of other things to do nearby if you don't want to play golf!